"Some day perhaps a climbing party will come across the remains of Mallory and Irvine where they have lain now for more than half a century. Such things are not unknown in the mysterious world of the mountains. But until that happens, nobody can say for certain what happened on 8 June 1924." 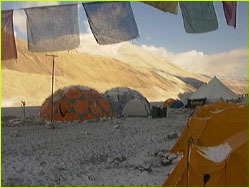 We all crawled into our tents three nights ago, knowing that Everest history had changed forever. An inch of snow fell at Base Camp, as if covering the landscape with the blank pages of a new chapter for the history books. Our imaginations tried to fill in those pages—it's all we could do down here at Base Camp—until Conrad Anker, Tap Richards, Andy Politz, Dave Hahn, and Jake Norton returned with news about their 12-hour search attempt out of Camp V.
Conrad Anker, in high spirits after the historic find. It was an excruciating three-day wait for us, knowing that the story had already broken out in the press. But we wanted to hear it directly from the team: Conrad Anker found George Mallory at 27,000 feet. As the light faded on the upper slopes of the mountain, the team walked seven abreast toward us across the endless sandy moraine to Base Camp. It was like a scene from Apollo 13—astronauts returning from their high adventure. They all looked a little slighter and sunburnt from 10 days up above 21,000 feet. But there was a distinct look in their eyes that I will never forget, one of having stepped back into history and come back, having seen an unmistakable truth. George Mallory fell to his death on his summit day, while climbing roped to Andrew Irvine. He tried to arrest his fall with his hands, and came to rest on a narrow rock ledge on the North Face of Everest. Mallory was face down, arms outstretched, his hands clenched to the frozen surface of the mountain. "I first saw a hobnail boot. And that was my first indication that I had come upon either Mallory or Irvine," said Anker in an interview that we filmed this morning. "Then the natural fibers of his clothing were another clue. We didn't know it was George at first, because all of the assumptions were that it was Sandy [Irvine's] body that was discovered by Wang, a Chinese climber, in 1975. But then we found two labels in his clothing, both indicating 'G.L. Mallory.'" Another clue found was a pair of snow goggles in his pocket, suggesting that he may have fallen after dark. In the upcoming days, we will report in more detail on the artifacts found with Mallory after we have had the opportunity to inventory and photograph them. Mallory and Irvine preparing for their final summit bid, 1924. There is much to do: interviews with the climbers to document their search day, photographing and inventorying of artifacts, and preparation for the next attempt on the mountain, which will include a search for Irvine (who may be near Mallory's body) using a metal detector and an attempt by Anker to free climb the Second Step as Mallory and Irvine would have climbed it. "After seeing George up there, I now think that he may have reached the summit before he fell," said Anker, answering the question that is now burning in all of our minds. Is there anything in this find that will indicate whether he and Irvine were the first to stand on the summit of Everest? The instant connection an expedition can have with the outside world through satellite communications can be dangerous up here where life and death intermingle so closely. Our three-day silence following the early reports from the search site that something of importance had been found was difficult, but we want to report responsibly on this story, making sure that all facts have been checked. When, in 1996, eight people died in a single day on Everest, the story broke out on the Web and by satellite phone through expeditions that were able to tune in to the frequencies of climbers trapped high on the mountain and in trouble. Erroneous news got out quickly and was picked up by the press. As we did in 1996 on Everest, and again in 1997 when we conducted physiological tests on climbers, we will report our story responsibly and as the facts are confirmed. Photos: (1,2) Liesl Clark; (3) Courtesy of the John Noel Photographic Collection. 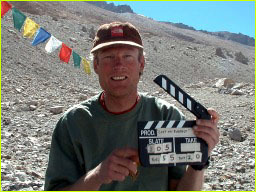 Members of the press: click here for NOVA/PBS ONLINE "Lost on Everest" media relations contacts.